In today’s post I’ll show you ten different ways to prepare, cook and eat delicious winter cabbage. Cabbage is not just any vegetable of course, it’s super rich in various minerals, including iron for healthy blood, and it’s low in fat and calories yet full of fibre to keep you satisfied at dinner time. To make this dish simply soften red onion in a wok or deep frying pan (in olive oil) then add cubed aubergine and cook until soft. Add about a tablespoon of water to the pan then add your cabbage and let it steam fry for 2-3 minutes (or slightly longer for larger quantities). Serve the cooked vegetables into a dish and add soft goat’s cheese immediately so some of it melts, then top with toasted pine nuts. This makes a great vegetarian dinner or can be served as a side dish to meat. FOOD FACT: 100 grams of cabbage contains only 25 calories! 2. 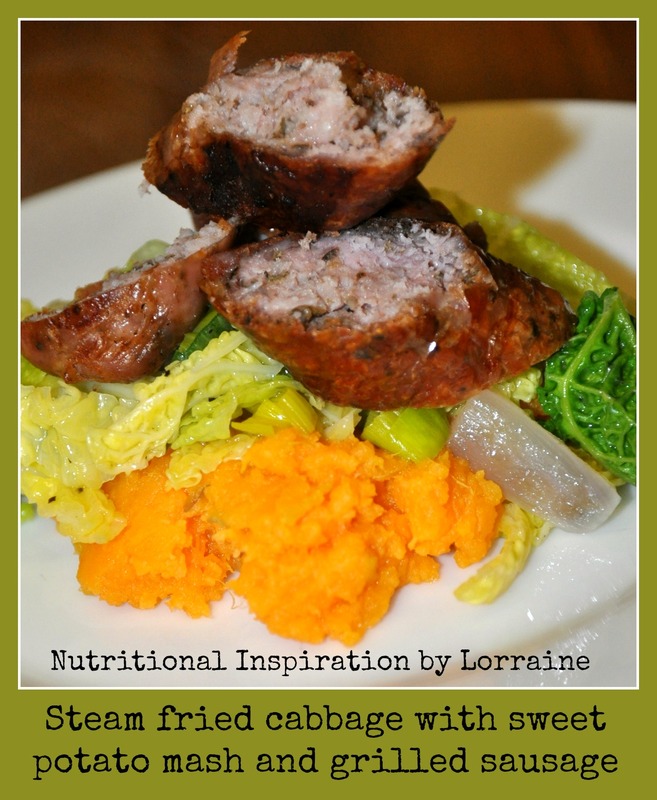 Steam fried cabbage with sweet potato mash and Cumberland sausage. Cook the cabbage in a similar way to the above dish: in a wok with a little onion, olive oil and water. Grill or bake your sausages (Buy the best quality you can afford, ideally with over 95% meat) and cook sweet potato in a little boiling water then mash when soft (butter optional!) Then serve in three layers for ‘posh’ presentation that will wow your little ones! FOOD FACT: Cabbage provides more Vitamin C than oranges! Use the winter vegetable to help boost your immune system and fight coughs and colds. 3. Cabbage and quinoa – light lunch. This is a great way to use up any leftover plain, cooked quinoa (brown rice, barley or couscous would also work well.) 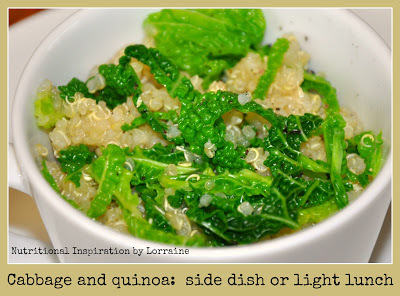 Simply cook or reheat the quinoa, adding a little light seasoning if desired. 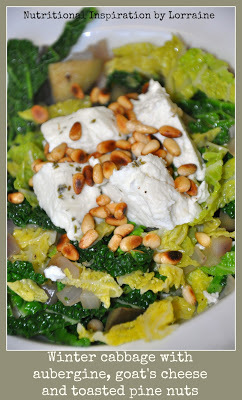 If you want a very low fat meal you should steam the cabbage, otherwise cook as above in a wok with a little olive oil. Adding red onion, garlic and mushrooms would further boost the vitamin and mineral content of this dish Simply mix the quinoa and cabbage together to serve and enjoy on a cold winter’s lunchtime. This delightful duo would also make a great base on which to serve meat or fish or a vegetarian protein such as nut and bean burgers. FOOD FACT: Cabbage contains lots of Vitamin K which plays a role in bone metabolism, meaning it can help give you stronger bones! 4. 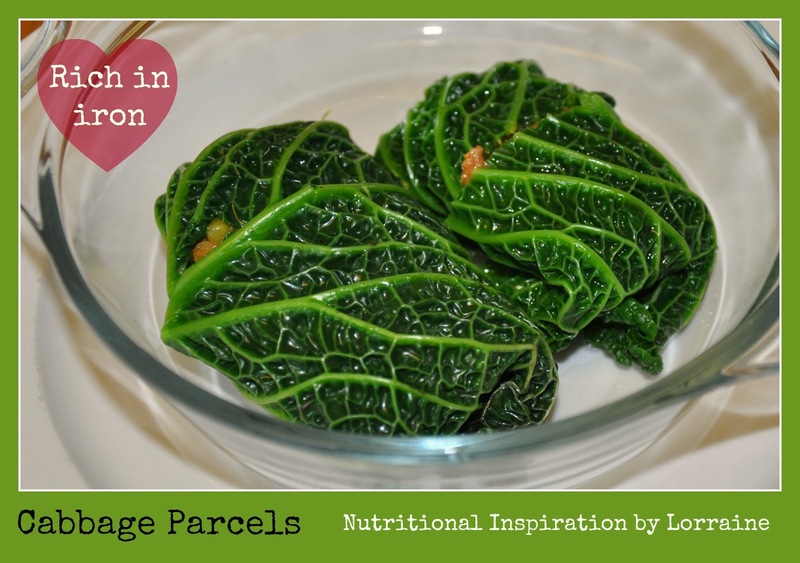 Cabbage parcels. Wash the outer leaves of your Savoy cabbage, remove the tough central stalk and blanch in boiling water for a minute or two until soft and pliable. 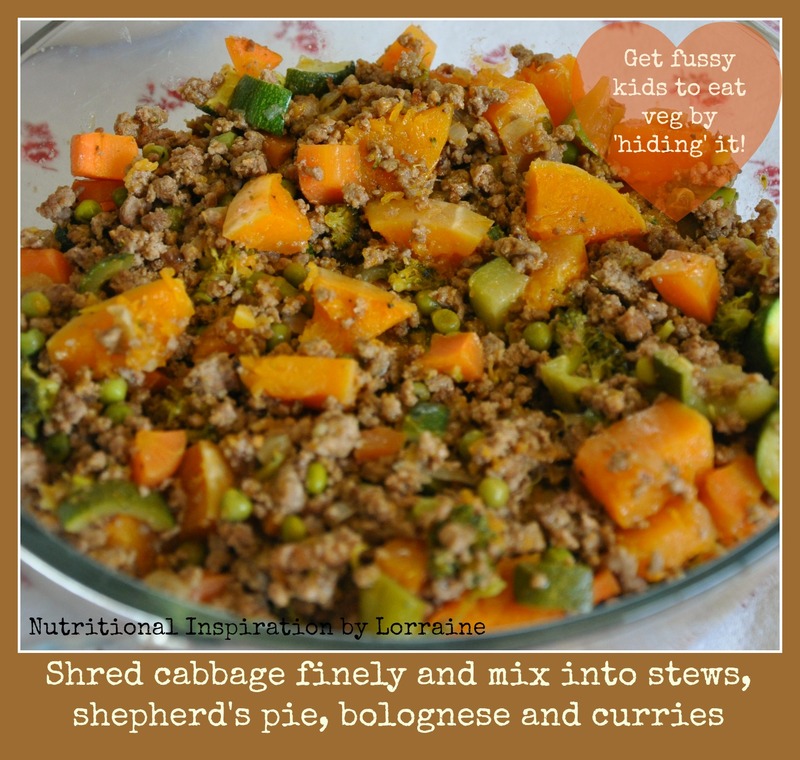 Leave to cool before spooning in a generous tablespoon of leftover minced meat and vegetables (leftover bolognese or shepherd’s pie works well), or use a vegetarian mix of brown rice or quinoa, seeds and lentils. Roll the base up first, then the sides, then fold the top over so the join is underneath the parcel. 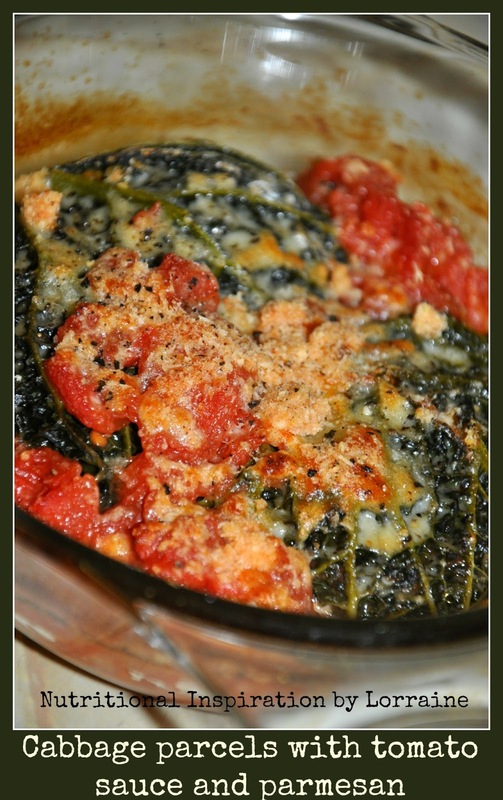 Place in a baking dish, pour over some chopped tomatoes or a tomato sauce (about half way up each parcel and a small amount on top), then add grated parmesan or other cheese of your choice. Bake for about 20 minutes or until cooked through and the cheese is golden. Serve with a crunchy, fresh salad of rocket, spinach and red pepper for a mineral-rich dinner to boost your health. 5. 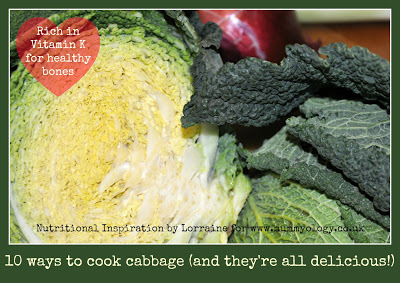 A great way to get all the benefits of cabbage is through its addition to stews and soups. 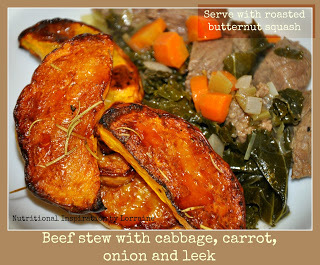 Shred finely and pop into a hearty beef stew, along with onion, leek, carrot and mushrooms. Serve alongside roasted butterbut squash. Simple winter dinners that cook in the oven with minimal preparation. 6. 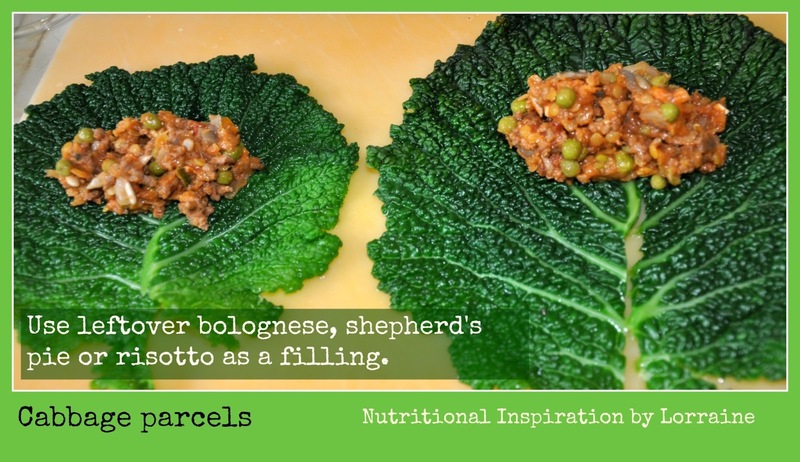 If you have fussy children who don’t eat their greens, then try shredding cabbage (or spinach or kale) into meals such as lasagne, bolognese, curry or shepherd’s pie where it will, hopefully, go undetected! 7. 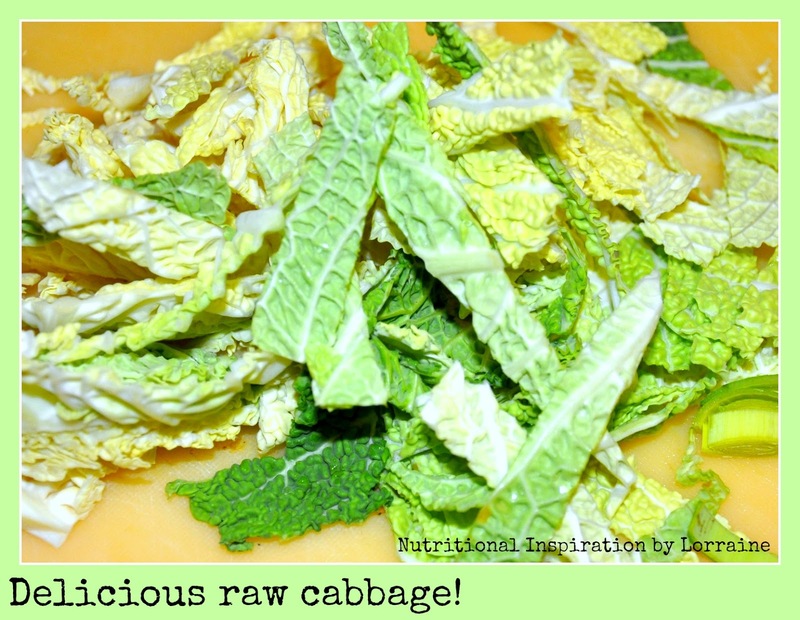 Of course, cabbage is not only good in hot meals, it has a great flavour and texture when eaten raw. Nibbling on raw vegetables while preparing dinner is a habit I picked up from my mum in childhood and something my children love too. They’re especially happy if I save them the broccoli stalk! If you’re trying to lose weight and this is a habit of yours (or worse – perhaps you nibble crisps and drink alcohol?!) 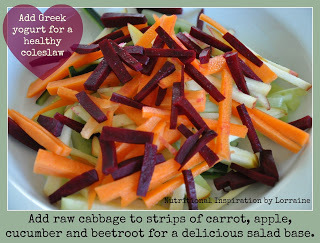 then try to set aside a portion of raw veg and stick to that one small bowl alone. So go ahead, and cut yourself a few slices of either savoy, white or red cabbage and just enjoy the crunchy, spicy flavour of this cheap and readily available winter vegetable. 8. 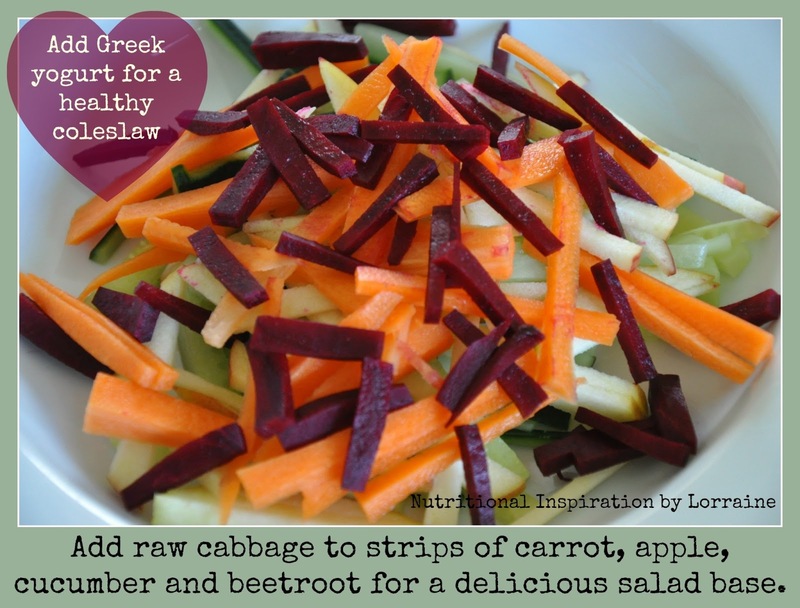 Use raw cabbage as a base for salads and coleslaws. Simply pile up or mix together different coloured vegetables for a rainbow treat to leave you full of vitality after the heavy-eating over the Christmas period. To make a healthier version of coleslaw, simply shred cabbage, onion and carrot and add Greek yogurt and seasoning, plus a little olive oil for a more intense flavour. 9. Here is a gorgeous dish I recently saw on TV. It is by chef Clare Smyth and was shown on the BBC programme Saturday Kitchen Best Bites. Her recipe for spiced duck breast with creamed savoy cabbage is available from the BBC website. You could swap duck equally well for pork or chicken or simply use her creamed cabbage recipe as a scrumptious side dish. 10. Bacon, Bean and cabbage soup. Finally, for everyone who likes the savoury, salty taste of bacon, here’s a great winter soup full of goodness. You’re getting a good balance of protein, carbohydrate, vegetables and fibre and a hearty dish that will last at least three days in the fridge. FOOD FACT: Cabbage is rich in manganese, Vitamin B6 and folate, B1 and B2, calcium, potassium, Vitamin A and magnesium plus trace amounts of iron and zinc. I hope I’ve inspired you to try new ways to cook the humble cabbage and to boost your family’s immune system and overall health by including this fabulous leafy green. Ps. 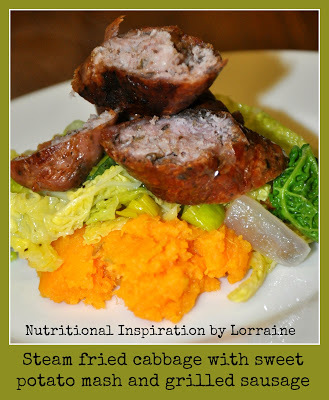 Don’t forget to visit my Facebook Business page for lots more food inspiration.